The City of Camrose, with a population of over 18,000, is just a one hour drive east of Edmonton. Once you get here, you will experience a city that is vibrant and alive with all of the amenities of a big city without the hustle and bustle. Stop in for a visit at the Bill Fowler Visitor Information Centre, and check out the 27 foot long hand-built replica of a Viking longship. The carved brick wall on the outside west entrance depicts images from nature around Mirror Lake. 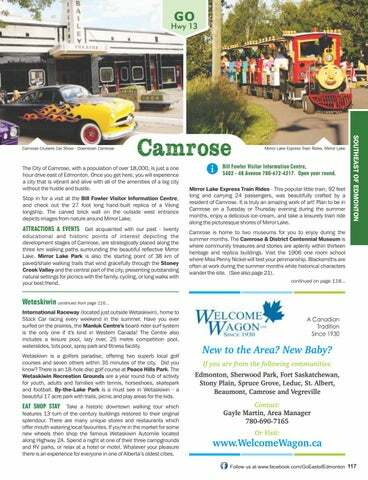 ATTRACTIONS & EVENTS Get acquainted with our past - twenty educational and historic points of interest depicting the development stages of Camrose, are strategically placed along the three km walking paths surrounding the beautiful reflective Mirror Lake. Mirror Lake Park is also the starting point of 38 km of paved/shale walking trails that wind gracefully through the Stoney Creek Valley and the central part of the city, presenting outstanding natural settings for picnics with the family, cycling, or long walks with your best friend. Bill Fowler Visitor Information Centre, 5402 - 48 Avenue 780-672-4217. Open year round. Mirror Lake Express Train Rides - This popular little train, 92 feet long and carrying 24 passengers, was beautifully crafted by a resident of Camrose. It is truly an amazing work of art! Plan to be in Camrose on a Tuesday or Thursday evening during the summer months, enjoy a delicious ice-cream, and take a leisurely train ride along the picturesque shores of Mirror Lake. Wetaskiwin continued from page 116... International Raceway (located just outside Wetaskiwin), home to Stock Car racing every weekend in the summer. Have you ever surfed on the prairies, the Manluk Centre's board-rider surf system is the only one if it's kind in Western Canada! The Centre also includes a leisure pool, lazy river, 25 metre competition pool, waterslides, tots pool, spray park and fitness facility. Wetaskiwn is a golfers paradise, offering two superb local golf courses and seven others within 35 minutes of the city. Did you know? There is an 18-hole disc golf course at Peace Hills Park. The Wetaskiwin Recreation Grounds are a year round hub of activity for youth, adults and families with tennis, horseshoes, skatepark and football. By-the-Lake Park is a must see in Wetaskiwin - a beautiful 17 acre park with trails, picnic and play areas for the kids. EAT SHOP STAY Take a historic downtown walking tour which features 13 turn of the century buildings restored to their original splendour. There are many unique stores and restaurants which offer mouth watering local favourites. If you're in the market for some new wheels then shop the famous Wetaskiwin Automile located along Highway 2A. Spend a night at one of their three campgrounds and RV parks, or relax at a hotel or motel. 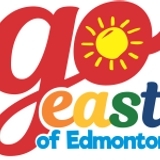 Whatever your pleasure there is an experience for everyone in one of Albertaâ&#x20AC;&#x2122;s oldest cities.